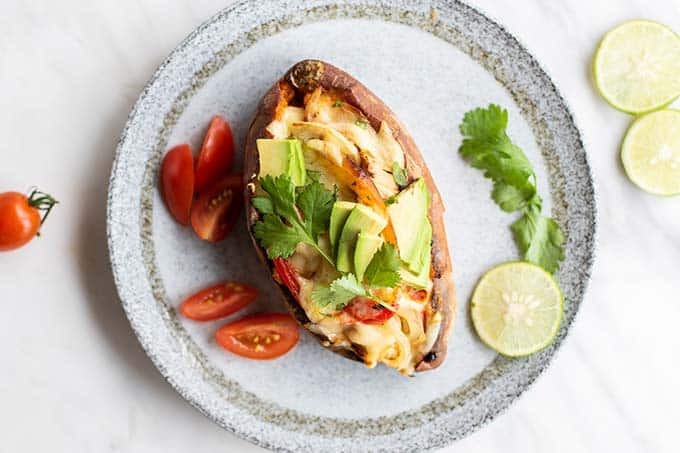 A healthy twice baked sweet potatoes recipe that will have your whole family asking for more! 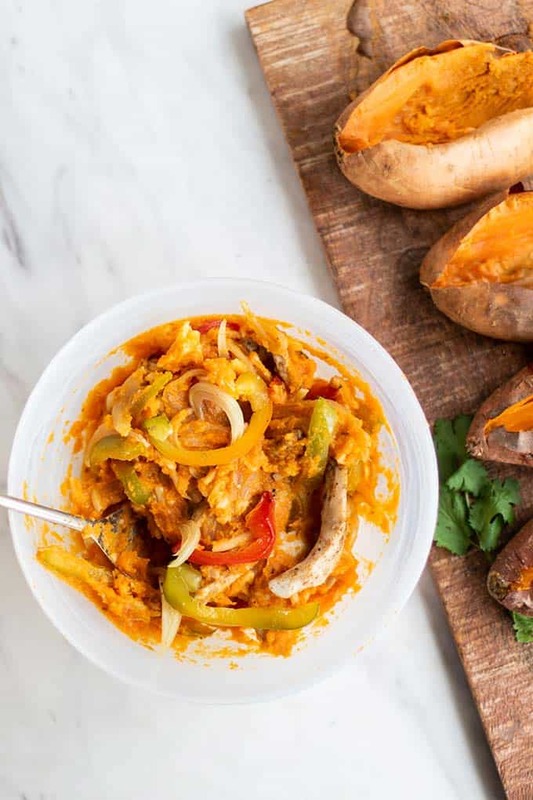 This easy dinner recipe combines the flavors of chicken fajitas wrapped up in a creamy sweet potato. 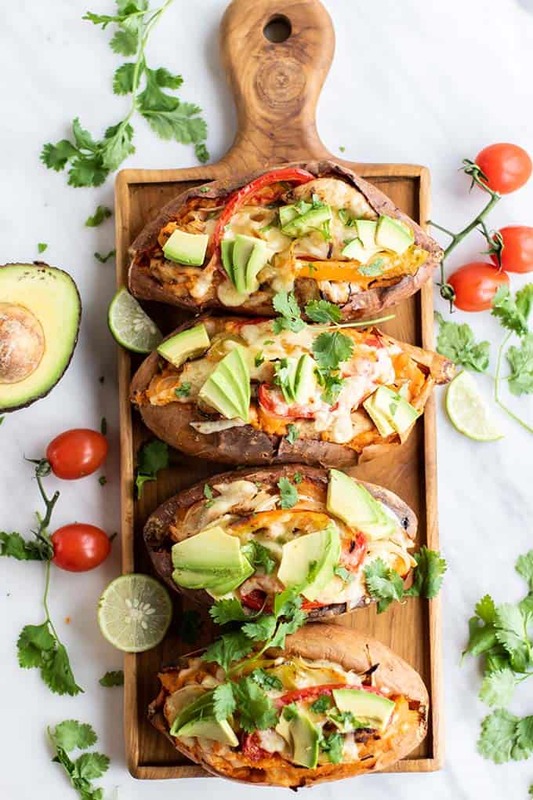 Twice Baked Sweet Potatoes with a Spicy Twist! I adore sweet potatoes. Baked, french fried, mashed, you name it, I am in! If you’re like me, then you HAVE to try this recipe. I started making these over the summer, and since then they have been on the reg in our meal rotation. You want something cozy and comforting — twice baked means twice as nice! The whole family needs a healthy and filling meal. 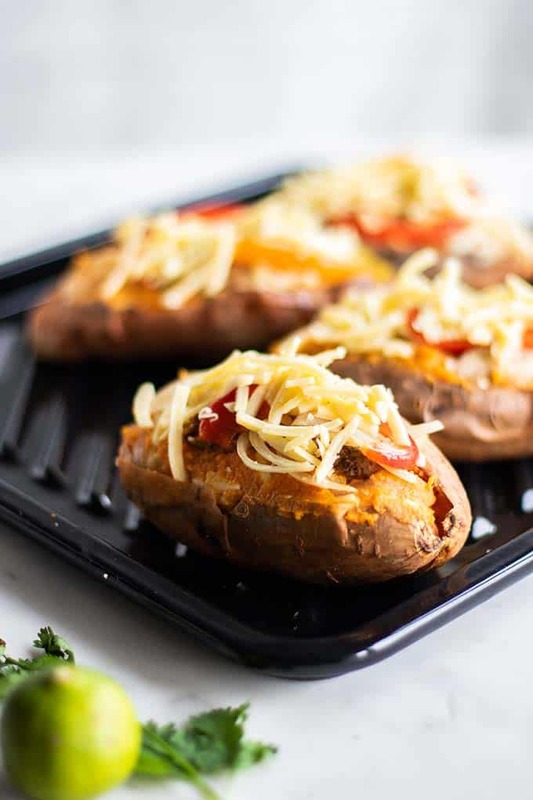 You don’t want to dirty a bunch of dishes — you can make these on 1 baking tray! 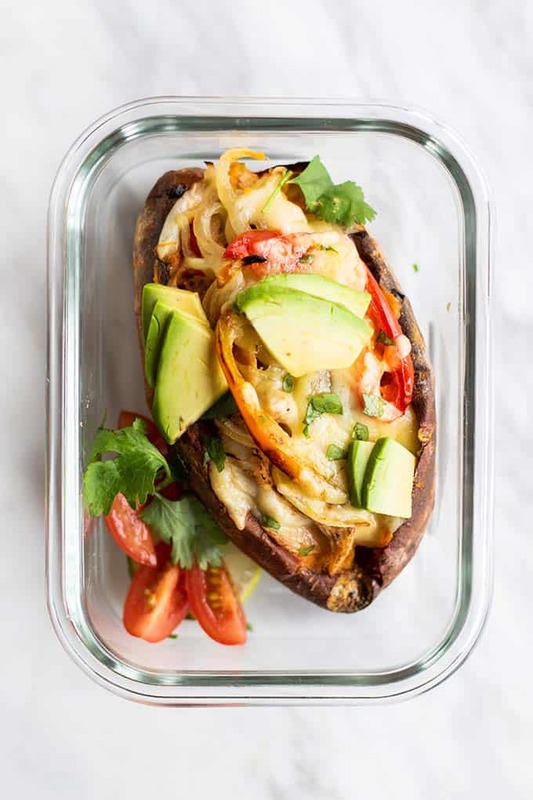 Meal prep — because who wouldn’t want to open up a container and find one of these at lunch?! If you’re vegetarian — no worries. 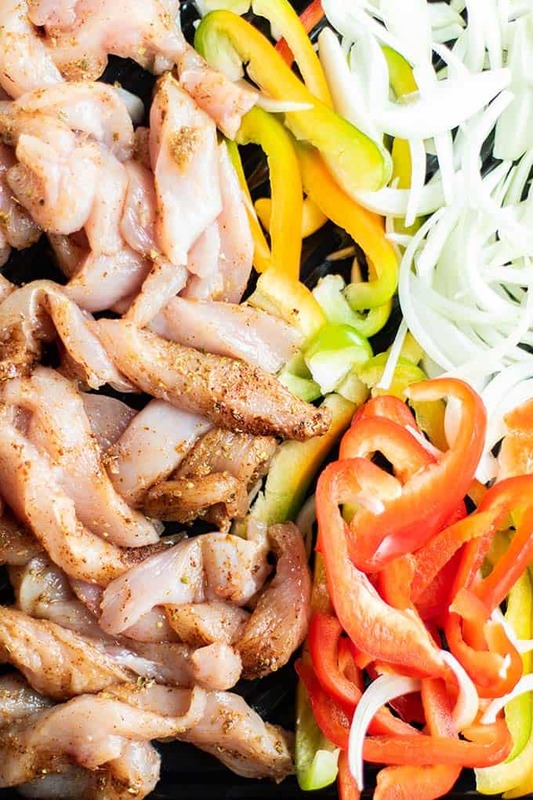 Swap the chicken for black beans, and add the spices to the veggies. Vegan? Still NO PROBLEM! Use the black bean swap, and then either use a vegan cheese or just omit the cheese and add extra guac on top! The only part of this recipe that is time consuming is actually baking the sweet potatoes the first time. You’ll want to bake them long and slow so they get creamy, smooth, and extra sweet inside. Once they are baked, cut them down the center, and scoop out about 75% of the potato inside. 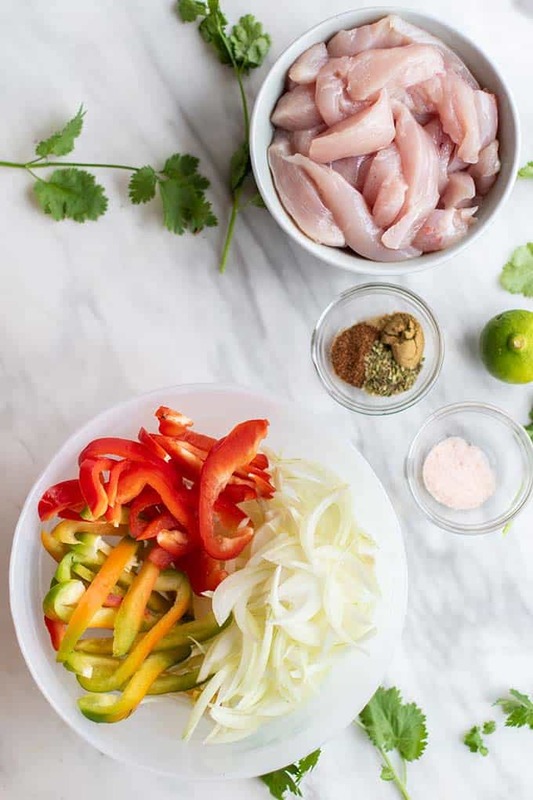 While you’re doing this, add some chicken with some seasonings to a baking tray, along with some sliced onions and peppers. Add the scooped out potato to a bowl, and stir (or mash!) until very creamy. 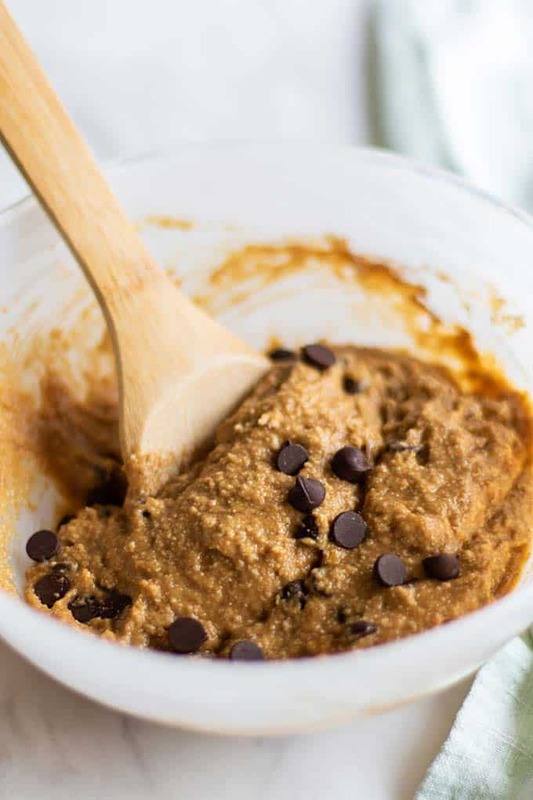 If you’re having trouble getting it smooth, you can add it to a food processor and even slightly under baked potato will smooth out for you! Then, mix in the roasted chicken, peppers and onions (or black beans! ), and then CHEESE! Because cheese makes everything better. We’ve made these without the cheese and they are still awesome — but I recommend going all the way with these! 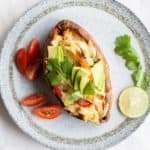 Add the sweet potato/fajita mixture back into the sweet potato skins — load them up high, and then top them with more cheese yet! These just need to go back in the oven for another 12 minutes or so, to reheat them and melt the cheese to gooey perfection. Sliced avocado — or go all the way with guacamole. Salsa — your favorite one! Sour cream or a cashew crema. You’re Going to Need to Double this Recipe! 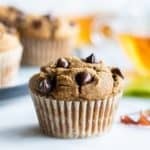 I’ve tried several times to meal prep this recipe, but somehow, they keep disappearing before lunch time rolls around. Hungry hands — but I am just grateful this healthy meal is popular in our house. 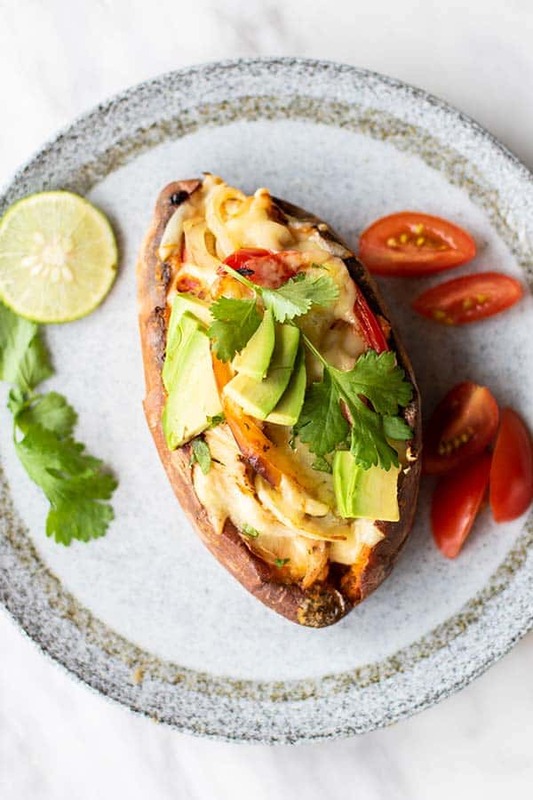 Bake sweet potatoes on 425 degrees F for 1 hour - 1 hour 30 minutes, depending on size. 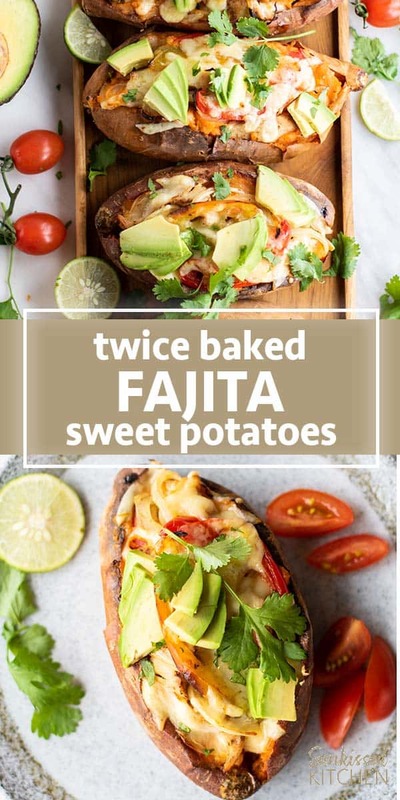 This Twice Baked Sweet Potato post may contain affiliate links, meaning if you make a purchase, I will receive part of the sale as a commission. This helps me continue to bring you lots of fresh and inspired recipes!